This article is about the modern highway. For the 19th century Ohio Turnpike, see Ohio State Route 125. Built from 1949 to 1955, construction for the roadway was completed a year prior to the Interstate Highway System. The modern Ohio Turnpike is signed as three interstate numbers: I-76, I-80, and I-90. The entire length of the Ohio Turnpike is 241.3 miles (388.3 km), from the western terminus in Northwest Township near Edon, where it meets the Indiana Toll Road at the Ohio–Indiana border, to the eastern terminus in Springfield Township near Petersburg where it meets the Pennsylvania Turnpike at the Ohio–Pennsylvania border. Most of the turnpike, 218.7 miles (352.0 km) between the Indiana border and an interchange with Interstate 76 (I-76) near Youngstown, is signed as part of I-80, while the eastern 22.6 miles (36.4 km), between the I-80/I-76 interchange and the Pennsylvania border, is signed as part of I-76. For 142.8 miles (229.8 km), between the Indiana border and Elyria, I-90 is cosigned with I-80 as part of the turnpike. The Ohio Turnpike does not pass directly into any major city, but does provide access to the four major metro areas in northern Ohio through connected routes. Two auxiliary Interstate highways, I-271 near Cleveland and I-475 near Toledo, cross the turnpike, but do not have direct connections. In Northwest Ohio, the turnpike passes through the southern part of the Toledo metropolitan area, with direct access to Toledo through I-75 and I-280. In Northeast Ohio, the turnpike passes through the southern suburbs of Greater Cleveland and the northern edge of the Akron metro area, with direct access to Cleveland via I-71, I-77, and I-480. Akron is connected to the turnpike via I-77 and State Route 8 (SR 8) in the north and I-76 on the east. The turnpike is located on the western and southern edges of the Mahoning Valley, with direct access to Youngstown through the remaining portion of I-80 east of the Turnpike, and I-680. In North Jackson, I-80 and I-76 swap each other's right-of-way; I-76 continues east as I-80 and I-80 continues southeast as I-76, carrying the turnpike with it. In Petersburg, the concurrent routes cross the state lines into Pennsylvania, automatically becoming the Pennsylvania Turnpike. In 1947 a bill was introduced in the Ohio General Assembly authorizing a privately financed roadway. Originally consisting of a system of five highways, the turnpike was reduced to one when the other four were made redundant by the Federal Aid Highway Act of 1956. Construction for the road cost $326 million and was recorded the biggest project in state history, with 10,000 employees, more than 2,300 bulldozers, graders, loaders and other machines over a 38-month period. On December 1, 1954, the first 22-mile (35 km) stretch (the portion lying east of SR 18) opened near the present-day exit 218 for I-76 and I-80. Several motorists attended a dedication ceremony, with over 1,000 people joining a caravan, following a snow plow and a patrol cruiser, to become the first to drive the turnpike. The remaining section from exit 218 west to Indiana opened on October 1, 1955. A connecting ramp near the Indiana state line closed on August 16, 1956, the day before the Indiana Toll Road was opened; this ramp had been used to allow traffic access to US 20 to cross into Indiana. The turnpike was named after the first chairman of the commission, James W. Shocknessy, in 1976. Originally, the turnpike offered 18 access points. Additional access points have since been provided, bringing the total number, including the Westgate and Eastgate toll barriers, to 31. Not included in this count is the unnumbered interchange at SR 49, which opened on December 29, 1992. There are no ramp tolls at this interchange; the Westgate toll barrier was, at the same time, moved from its previous location near the Indiana state line to its current location, which is east of SR 49. In 1996, the turnpike began a project to add one lane in each direction from Toledo to Youngstown. The project, using financing from increased tolls, was originally projected to be finished in 2005, but was not completed until the end of the 2014 construction season. In 1998, the Ohio Turnpike Commission began phasing in distance-based exit numbers; the sequential numbering system was retired in September 2002. In 2009, the Ohio Turnpike Commission began accepting E-ZPass for toll payment at all plazas, and added gates to toll lanes to prevent motorists from evading tolls. Ken Blackwell, the defeated candidate in the 2006 Ohio governor's race, had announced a plan for privatizing the turnpike, similar to plans enacted in Illinois and Indiana. In 2010 and 2011, Governor John Kasich stated that he would consider a turnpike lease, but only during a prosperous economic period. In August 2011, Kasich stated his intention to create a task force to produce a leasing plan and also considered the option of reassigning the maintenance of the highway to the Ohio Department of Transportation (ODOT). Ultimately he decided against both, instead proposing to issue more debt under the renamed Ohio Turnpike and Infrastructure Commission, with cash tolls raised annually over a ten-year period to compensate. The Ohio Turnpike opened on October 1, 1955, with a 65 mph (105 km/h) limit for cars and 55 mph (89 km/h) limit for trucks. The automobile speed limit was increased on September 30, 1963, in concert with other Ohio rural Interstates to 70 mph (110 km/h). Due to the National Maximum Speed Law, a 55 mph speed limit took effect in 1974 for all vehicles. The 55 mph limit remained until 1987 when the Ohio General Assembly adopted the federally permitted 65 mph maximum speed limit, but for automobiles only. Governor Taft asked the Ohio Turnpike Commission to work with ODOT and the OSHP to formulate a plan to encourage truck traffic to use the turnpike instead of parallel highways, improving the safety of those other roadways. The three organizations created a plan with three points. The truck speed limit was increased from 55 to 65 mph (89 to 105 km/h) for consistency with the automobile limits. Enforcement of truck weight and speed limits on parallel highways was increased, and truck toll rates were lowered in a trial. The speed limit increase took effect on September 8, 2004. The Ohio Turnpike has had uniform limits for all vehicles since 2004. On December 20, 2010, the Ohio Turnpike Commission voted to increase the speed limit of the Ohio Turnpike to 70 mph. Despite opposition from the Ohio Trucking Association, the increase was approved by the Commission by a vote of 4–1 and went into effect on April 1, 2011. The Ohio Turnpike has had service plazas since its inception. Service plazas differ from typical freeway rest areas in that they offer amenities such as 24-hour food and fuel service; motorists do not have to pass through toll booths to re-fuel, use the restroom, or eat. In 1998, The Ohio Turnpike Commission began modernizing its service plazas, first demolishing the original plazas and then reconstructing them from the ground up. In addition to modern restrooms, the new plazas offer several fast food choices, which vary between the plazas. They also include ATMs, gift shops, travel information counters, Wi-Fi internet access, and facilities for truck drivers, including shower facilities, lounge, and laundry areas. Sunoco fuel stations are provided at all service plazas along the Ohio Turnpike. The company signed a new contract to operate all 16 plazas on the Ohio Turnpike beginning in 2012. Facilities for overnight RV campers are provided at the service plazas located at mile markers 20, 76, 139, and 197. Service plazas are located in pairs (one for each side of the turnpike) near mile markers 20, 76, 100, 139, 170, 197, and 237. The service plazas located at mile marker 49 were demolished in 2011 and there are no plans to rebuild. The service plazas located in Lucas County west of Toledo at mile marker 49 were the least utilized. The Ohio Turnpike Commission eventually demolished them, and plans construction of new plazas between mile markers 20 and 49; the new facility will most likely be located in Fulton County and is expected to open after 2012. Due to the lack of a municipal water/sewer system, the service plazas located near mile marker 20 in Williams County were demolished in 2006, though they were eventually rebuilt and reopened on June 29, 2011. The plazas at mile 237 reopened in 2013. Since the turnpike opened, the Ohio Turnpike Commission has contracted with the Ohio State Highway Patrol (OSHP) District 10 to provide law enforcement, as well as assistance to disabled or stranded motorists. The Patrol is the only law enforcement agency with jurisdiction on the turnpike. It monitors Citizen's Band channel 9 for distress calls. Tolls are based upon the distance traveled, as well as the height and axle-count of vehicle driven. As of January 2018[update], the toll for a typical non-commercial passenger vehicle to travel the entire turnpike is $12.75 for E-ZPass holders and $18.75 for non E-ZPass holders. For purposes of toll calculation, as these barriers are not actually exits, the Westgate toll barrier is counted as exit 2 and the Eastgate toll barrier is counted as exit 239 on toll tickets. The Ohio Turnpike Commission had been hesitant to deploy an electronic tolling system, citing an apparent lack of commuter travel as well as significant implementation expenses. In December 2006, the commission indicated their intention to move forward with the implementation of an E-ZPass-compatible system as a "customer convenience". The system was activated on October 1, 2009. In 2009, the turnpike became the first publicly owned toll facility in the U.S.—and the second overall—to allow users to pay tolls with a debit or credit card. In April 2008, Governor Ted Strickland and legislative leaders announced a planned stimulus package that would redistribute Turnpike tolls to road projects throughout the state. On May 23, the Ohio Senate Finance Committee voted to pass a new version of the package which would not involve tolls collected. In March 2019, the turnpike commission announced plans to add high-speed E-ZPass lanes to the Westgate and Eastgate toll plazas, which will allow E-ZPass users to travel through the toll areas at 70 mph (110 km/h). Construction is expected to begin in early 2020 with completion in late 2021 or early 2022. Until 1998, the turnpike numbered exits sequentially, but afterwards started the process of renumbering them by the milepost system. This was done to "alleviate confusion from the irregular sequence of numerical references" due to recently added interchanges as well as to conform to federal standards. The conversion ran from January 1998 to September 2002 with dually posted numbers during that period. ^ a b The name of the agency was the Ohio Turnpike Commission until July 1, 2013, when the name was changed to its current form by the Ohio General Assembly. ^ Ohio General Assembly (July 1, 2013). "5537.02 Ohio turnpike and infrastructure commission". Ohio Revised Code. Retrieved September 2, 2013. ^ a b Grant, Alison (September 24, 2015). "Ohio Turnpike Opened 60 Years Ago to Swarms of Onlookers at Midnight Ceremony". The Plain Dealer. Cleveland. Retrieved September 28, 2015. ^ a b Ohio Turnpike Commission (n.d.). "History: A Dream Realized..." Ohio Turnpike Commission. Archived from the original on August 3, 2009. Retrieved August 11, 2009. ^ Ohio State Highway Patrol (n.d.). "Chapter 3: Giant Strides, 1946–1964". The First 60 Years, A History of Service. Ohio State Highway Patrol. Archived from the original on March 2, 2008. Retrieved July 10, 2007. ^ "Exit on Ohio Turnpike Closed". The Pittsburgh Press. August 16, 1956. p. 7. Retrieved August 27, 2012. ^ United States Geological Survey (1990). Clear Lake, Ind.–Ohio–Mich (Topographic map). 1:24,000. 7.5 minute. Reston, VA: United States Geological Survey. Archived from the original (PDF) on April 8, 2013. Retrieved August 27, 2012. ^ a b Lewis, Herb (December 30, 1992). "Turnpike Exchange near Edon Is Officially Opened". The Bryan Times. Retrieved August 26, 2012. ^ Harvey, Hank (February 28, 1993). "Turnpike Commission May Branch Out". The Blade. Toledo, OH. Retrieved August 26, 2012. ^ Grant, Alison (January 15, 2014). "Ohio Turnpike's Final Third-lane Section to Be Built This Summer; Other Turnpike Construction Planned This Year". The Plain Dealer. Cleveland. Retrieved January 26, 2014. ^ Theis, Sandy (June 4, 2006). "Leasing Turnpike: A Road to Riches? Blackwell Says His Plan Could Net Millions for Cities, but Others Urge Caution". The Plain Dealer. Cleveland. Retrieved June 18, 2008. ^ Pierce, Gene (January 24, 2006). "Lease Turnpike to Create $4–6 Billion Job Development Fund" (Press release). Ohioans for Blackwell. Archived from the original on November 1, 2006. Retrieved June 18, 2008. ^ Feran, Tom (January 19, 2011). "Gov. John Kasich Hasn't Dismissed Privatizing Ohio Turnpike, if the Numbers Are Right". PolitiFact Ohio. Retrieved January 24, 2011. ^ Fields, Reginald (August 12, 2011). "Gov. John Kasich Moves Ahead with Turnpike Leasing Proposal". The Plain Dealer. Cleveland. Retrieved August 12, 2011. ^ Breckenridge, Tom (December 13, 2012). "Gov. Kasich Wants to Issue $1.5 Billion in Ohio Turnpike Debt for Projects in Northern Ohio". The Plain Dealer. Cleveland. Retrieved December 13, 2012. ^ Ohio Turnpike Commission CFO/Comptroller’s Office and the Office of Public Affairs & Marketing (March 16, 2006). "Comprehensive Annual Financial Report for the Year Ended December 31, 2005" (PDF). Berea: Ohio Turnpike Commission. p. 22. Archived from the original (PDF) on May 29, 2014. Retrieved May 29, 2014. ^ Ohio Turnpike Commission CFO/Comptroller’s Office and the Office of Public Affairs & Marketing (March 16, 2006). "Comprehensive Annual Financial Report for the Year Ended December 31, 2005" (PDF). Berea: Ohio Turnpike Commission. p. 28. Archived from the original (PDF) on May 29, 2014. Retrieved May 29, 2014. ^ Ohio Turnpike Commission (December 20, 2010). "Resolution Providing for a Uniform Speed Limit of 70 MPH for the Entire Ohio Turnpike" (PDF). Ohio Turnpike Commission. Archived from the original (PDF) on December 27, 2010. Retrieved December 20, 2010. ^ Ewinger, James (December 20, 2010). "Ohio Turnpike Commission Votes To Raise Toll Road's Speed Limit to 70 mph". The Plain Dealer. Cleveland. Retrieved December 20, 2010. ^ Breckenridge, Tom (April 1, 2011). "Ohio Turnpike Drivers Can Press the Pedal a Bit More as Speed Limit Climbs to 70 mph". The Plain Dealer. Cleveland. Retrieved April 2, 2011. ^ Maykuth, Andrew (December 24, 2010). "Sunoco Adding Sales Outlets in Ohio, N.Y." The Philadelphia Inquirer. Retrieved March 5, 2012. ^ a b Ohio Turnpike Commission (n.d.). "Service Plazas". Ohio Turnpike Commission. Archived from the original on October 6, 2012. Retrieved October 20, 2012. ^ Ohio Turnpike Commission (May 16, 2005). "Resolution Approving the Acquisition of Right-of-Way for Construction of Service Plaza Facilities in Fulton County". Ohio Turnpike Commission. Archived from the original on September 27, 2007. Retrieved August 7, 2011. ^ a b Staff (August 16, 2005). "Williams County Turnpike Plazas Will Be Closed". The Blade. Toledo, OH. Archived from the original on September 30, 2007. Retrieved August 7, 2011. ^ Farkas, Karen (November 2, 2009). "Whatever Happened to ...? : Whatever Happened to Plans To Add a Third Lane to the Ohio Turnpike and Replace the Eight Sets of Service Plazas?". The Plain Dealer. Cleveland. Retrieved November 3, 2009. ^ Ohio Turnpike Commission (August 15, 2005). "Resolution Authorizing the Closure of Indian Meadow and Tiffin River Service Plazas at Milepost 20.8 in Williams County". Ohio Turnpike Commission. Archived from the original on May 24, 2006. Retrieved August 7, 2011. ^ Breckenridge, Tom (August 18, 2012). "Ohio Turnpike Says Problems with Contractor Delay New Service Plazas". The Plain Dealer. Retrieved August 18, 2012. ^ "The James W. Shocknessy Ohio Turnpike Proposed Schedule of Tolls for E-ZPass Class 1–Class 7 Effective 1/1/2018" (PDF). ^ Ohio Turnpike Commission (n.d.). "The James W. Shocknessy Ohio Turnpike Proposed Schedule of Tolls for Non E-ZPass Class 1–Class 7 Effective 1/1/2018". Ohio Turnpike Commission. Archived from the original (PDF) on March 1, 2012. ^ a b c Ohio Turnpike Commission (n.d.). "Interchanges". Ohio Turnpike Commission. Archived from the original on August 17, 2011. Retrieved August 7, 2011; Ohio Turnpike Commission; Travel Boards (2012). 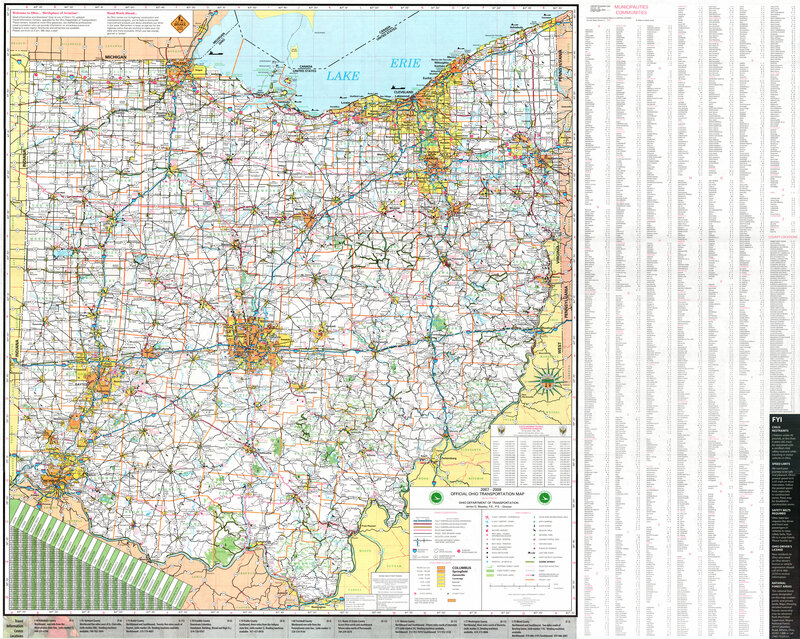 Ohio Turnpike Map & Lodging Guide (Map). Berea: Ohio Turnpike Commission. ^ Ohio Turnpike Commission (n.d.). "E-ZPass Frequently Asked Questions". Ohio Turnpike Commission. Archived from the original on July 27, 2011. Retrieved August 7, 2011. ^ Farkas, Karen (October 2, 2009). "E-ZPass Debut Has Bugs, but Turnpike Officials Are on the Case". The Plain Dealer. Cleveland. Retrieved October 2, 2009. ^ Farkas, Karen (June 8, 2009). "Ohio Turnpike To Let Drivers Pay Tolls with Credit, Debit Cards". The Plain Dealer. Cleveland. Retrieved June 8, 2009. ^ Marshall, Aaron (April 3, 2008). "Ohio Tries To Retain Top Talent in College; Internship Plan Raids Tobacco, Turnpike Funds". The Plain Dealer. Cleveland. Retrieved April 8, 2008. ^ Hollander, Sarah; Marshall, Aaron (April 5, 2008). "Turnpike Officials Unsure What Revenue Loss Will Mean". The Plain Dealer. Cleveland. Retrieved April 8, 2008. ^ Marshall, Aaron (May 23, 2008). "State Stimulus Package Won't Include Turnpike Funds". The Plain Dealer. Cleveland. Retrieved May 28, 2008. ^ Gauntner, Mike (March 19, 2019). "Ohio Turnpike plans to remove toll gates". WFMJ. Retrieved March 19, 2019. ^ Ahmed, Ferzan M. (March 2019). "Priorities Include Modernizing our Toll Collection System". Customer Connection. Ohio Turnpike and Infrastructure Commission. Retrieved March 21, 2019. ^ Ohio Turnpike Commission (n.d.). "Interchange Number Conversion". Ohio Turnpike Commission. Archived from the original on December 4, 2002. Retrieved February 20, 2019. ^ Hakos Dehrmann, Lauren (May 23, 2002). "Plans Underway to Switch Interchange Numbers to Milemarkers" (Press release). Ohio Turnpike Commission. Archived from the original on June 9, 2002. Retrieved February 20, 2019. ^ Hakos Dehrmann, Lauren (September 13, 2002). "Turnpike Interchange Signs Switching Over This Month" (Press release). Ohio Turnpike Commission. Archived from the original on December 4, 2002. Retrieved February 20, 2019. ^ DeLorme (2007). Street Atlas USA (Map). DeLorme. ^ Patch, David (November 10, 1998). "Archbold Turnpike Exit to Open". The Blade. Toledo, OH. Retrieved June 18, 2008. ^ "Fulton County Turnpike Gate To Open Friday". The Blade. Toledo, OH. December 17, 1996. Retrieved June 16, 2008. ^ Harvey, Hank (November 22, 1991). "Interchange Opens to Jobs, Growth". The Blade. Toledo, OH. Retrieved April 2, 2013. ^ Harvey, Hank (December 5, 1991). "Perrysburg I-75 Link to Turnpike Opens". The Blade. Toledo, OH. Retrieved April 2, 2013. ^ Patch, David (February 7, 1997). "Turnpike's Gate 5A Opens, Widens Elmore Area Access". The Blade. Toledo, OH. Retrieved June 16, 2008. ^ a b McEaneney, Dennis (December 2, 1994). "Gate 13A Joins Pike". Akron Beacon Journal. Retrieved June 16, 2008. ^ Kavanaugh, Molly (December 14, 1995). "New Turnpike Interchange Opens at Baumhart Road". The Plain Dealer. Cleveland. ^ "Turnpike Ramp at SR 58 To Open Today After 11 Years". The Morning Journal. Lorain, OH. November 30, 2004. Retrieved June 16, 2008. ^ "Ohio Turnpike, I-77 Interchange Opens to Traffic". Cleveland: WEWS-TV. December 3, 2001. Archived from the original on March 4, 2009. Retrieved June 16, 2008. ^ Farkas, Karen (June 21, 2009). "Bari Lambert's Job as a Toll Collector on the Ohio Turnpike's Lordstown Plant Exit Has Turned Very Quiet". The Plain Dealer. Cleveland. Retrieved June 22, 2009. Wikimedia Commons has media related to Ohio Turnpike.